Minister for defense production Zubaida Jalal has called upon the society to discourage negative attitudes and promote peace with an intention to encourage equality. 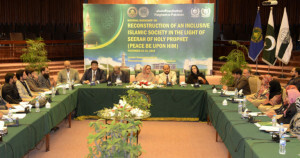 She was addressing here exhibition of Seerah books and a two- day training workshop on “Reconstruction of an Inclusive Islamic Society in Pakistan in the light of Seerah of Prophet (PBUH) organized by Islamic Research Institute (IRI) of International Islamic University, Islamabad (IIUI). The workshop is being attended by Ulema, teachers, civil society representatives and researchers. Zubaida Jalal emphasized that Paigham e Pakistan narrative is a voice of nation for peaceful societies. She added that the government will take this narrative dissemination campaign to Baluchistan and Sindh where special programs will be arranged to discuss peace and contents of Paigham e Pakistan which are focused on discouraging violence. She also appreciated services of IIUI and IRI for the cause of Pakistan. She said educational institutions are important places in a society and teachers are the legacy holders of the Prophets. Zubaid Jalal furthered that following the Prophet is solution to the problems. The Minister added that Islam is not only confined to rituals but it is to implement the teachings of the Prophet (PBUH). Taking about the rights provided by Islam she said that equal opportunities and contributions for men and women can help in establishing a balanced society and Islam has defined rights for both of them minutely. Dr. Masoom Yasinzai, IIUI Rector said that society should be established on the bases of teachings provided by Prophet (PBUH). 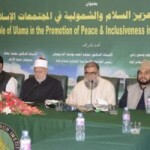 He said that there was a dire need of reconstruction of the society with an implementation of true teachings of Islam. IIUI is working to establish a Seerah center to announce Post-Doctoral fellowships for research on implementation of Seerah in society. Practical steps of the life of Holy Prophet (PBUH) should be implemented in the schools to nurture our children as per sacred teachings. IIUI President, Dr. Ahmed Yousif Al-Draiweesh discussed various aspects of the life of Prophet (PBUH). He said that His teachings are all about thinking good for others, working for peace and refraining from violence. IIUI president said that educational institutions must come forward to introduce the teachings for Holy Prophet (PBUH) to the world. He suggested that joint researchers and conferences be launched on Seerah of Prophet (PBUH). Dr. Muhammad Zia ul Haq, Director General IRI presented the objectives of the workshop and also discussed a detailed history of the awareness campaign and dissemination and creation of Paigham e Pakistan. He also told that as many as 32 research articles, 11 books have been prepared and presented on the narrative during the campaign. The event was also attended by IIUI VP Dr. Aqdas Naveed Malik, Director Administration Khalid Mehmood Raja and other relevant officials. Earlier, the minister visited Dr. Muhammad Hamidullah Library and inaugurated the library mounted exhibition and took keen interest in the rare books displayed at the exhibition.